The tender, delicate and bright-green stalks of asparagus give a splash of colour to any meal. These shoots also stand up well to intense heat, including the BBQ grill. Asparagus is an excellent source of Vitamin A and folate too. Storage Tip: Asparagus likes to be stored standing up. Place it in a tall container in a cold section of your fridge with the cut ends at the bottom in a bit of water or ice. It can be stored with herbs that enjoy a similar setup, like parsley or cilantro. Preparation Tip: All asparagus spears should be snapped at their natural breaking or bending point. Thin asparagus don't need to be peeled, but thicker asparagus can be peeled with a potatoes peeler. 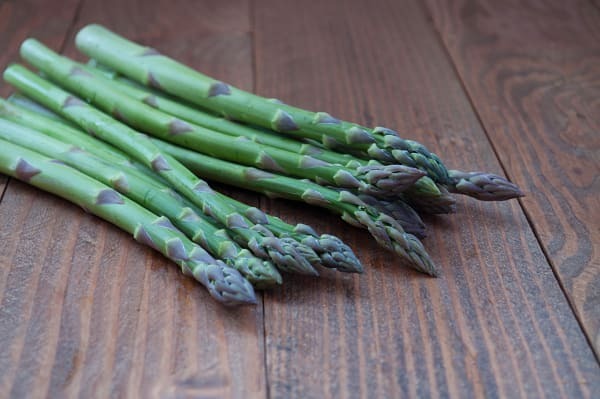 Asparagus can be sauteed, steamed, fried, baked or peeled and added to a garden salad. Did you know... White asparagus contains fewer vitamins than green asparagus. Though it commonly appears in markets year-round, its actual crop season is Spring. Asparagus is reportedly a helpful hangover cure as it boosts levels of key enzymes that break down alcohol. Culinary Compatibility: Asparagus goes well with butter, olive oil, nuts, lemon juice and zest, sesame seeds, aged and nutty cheeses, garlic, ginger, green onions, and herbs. Pairs well with bacon, sausage and prosciutto. Health Information: 7 spears (100g) contain only 24 calories but provide 2/3 of your daily folate needs! Asparagus contains more glutathione than any other fruit or vegetable, and this antioxidant plays an important role in the prevention of certain cancers and diseases, nutrient metabolism and regulating DNA and protein synthesis.